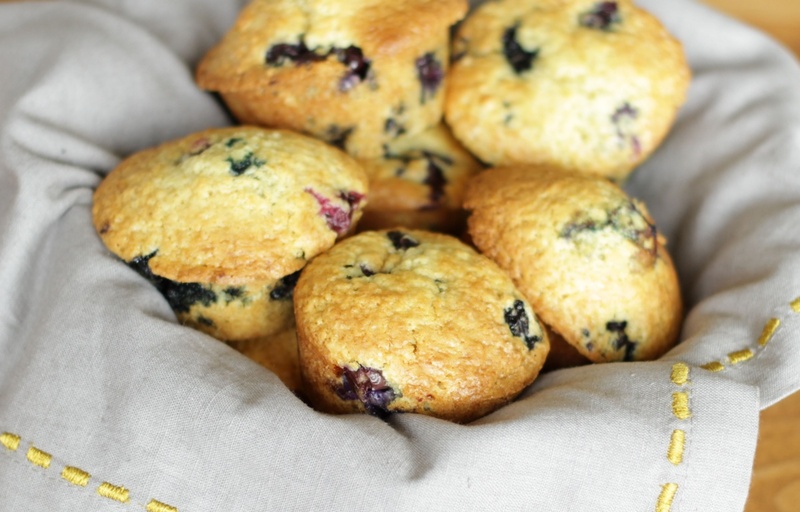 Sour cream keeps these muffins perfectly moist and fluffy. Using fresh blueberries in the summer is best but you can make these using frozen blueberries and they are still delicious. **Recipe updated 7/2016. 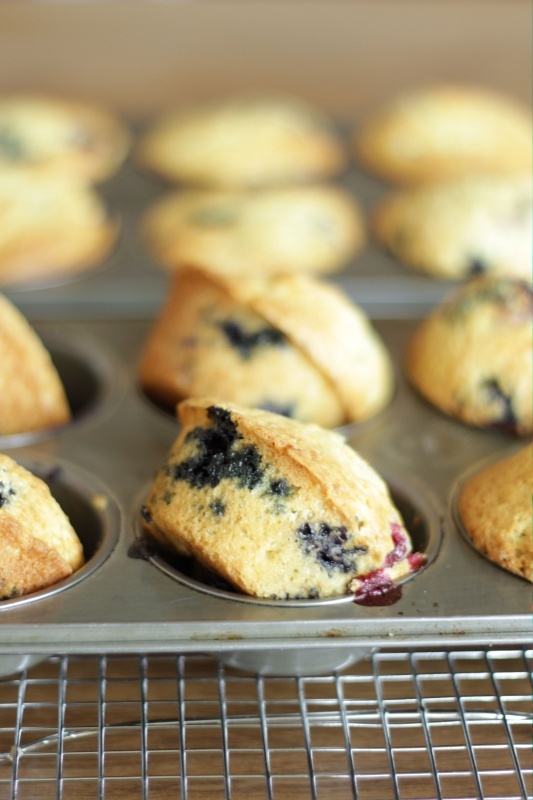 We make these blueberry muffins often and we’ve found that these particular muffins tend to stick to the pans and are hard to remove whole even if you’ve greased the pans well. I highly recommend using paper cupcake liners when you make these to save yourself the disappointment of stuck muffins. I’ve also learned that when baking muffins, if you preheat the oven to a high temperature, 400°F (200°C) before putting the muffins in and then reducing the heat after 5 minutes of baking, the muffins rise higher and the edges also don’t stick to the muffin pan. (No more muffin tops.) If you prefer to bake them the traditional way, preheat oven to 375°F (180°C) and bake the muffins for 18-20 minutes until a toothpick comes out clean. Preheat oven to 400°F (200°C). Line muffin pan with 12 cupcake liners. In a large bowl, stir together flour, sugar, baking powder, baking soda and salt. In a medium bowl combine egg, sour cream, butter and vanilla extract. Pour the sour cream mixture into the flour mixture and gently stir together just until blended. Batter will be thick. Fold in blueberries. 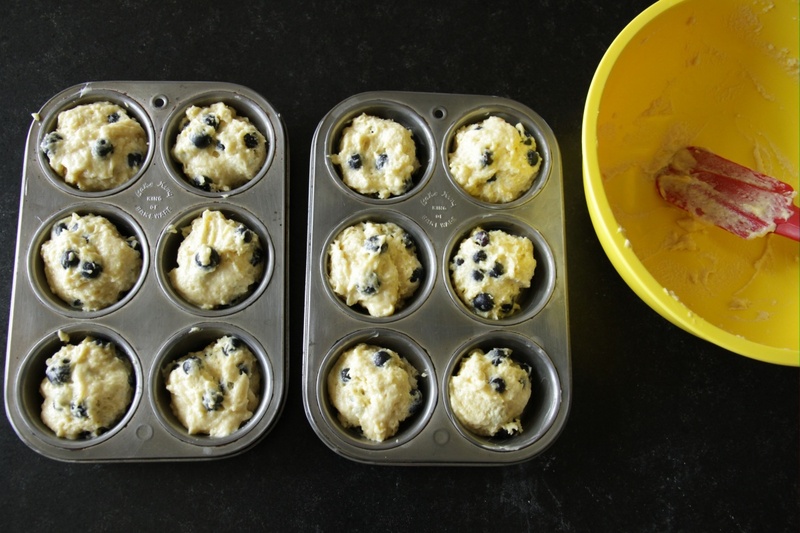 Divide batter evenly among the 12 muffin cups. Bake for 5 minutes at 400°F (200°C) then reduce heat without opening the oven to 350°F (165°C) and bake for an additional 12-15 minutes, until a toothpick comes out clean. Cool in the pan on a wire rack for 5 minutes then remove muffins from pan and serve warm or cool completely on wire rack. Store in an airtight container at room temperature for one day or freeze for up to two months. Recipe adapted from More Muffins by Barbara Albright and Leslie Weiner.